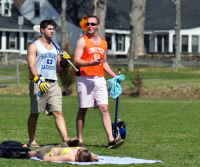 Quinnipiac students spend time outside on the Quad Thursday afternoon enjoying the sun. A Quinnipiac student spends time outside on the Quad Thursday afternoon throwing a football. A Quinnipiac student spends time outside on the Quad Thursday afternoon enjoying the sun. Quinnipiac students spend time outside on the baseball field Thursday afternoon playing frisbee. 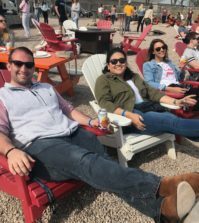 Quinnipiac students spend time outside near Hogan Road Thursday afternoon enjoying the sun. A Quinnipiac student spends time outside on the Quad Thursday afternoon playing frisbee. Quinnipiac students spend time outside on Dorm Road Thursday afternoon enjoying the sun. Quinnipiac students spend time outside on the baseball field Thursday afternoon enjoying the sun. Quinnipiac rugby players return from practice at Alumni Field Thursday afternoon. A dog graces Quinnipiac’s campus Thursday afternoon. Quinnipiac students spend time outside near Eastview at York Hill Thursday afternoon playing baseball. 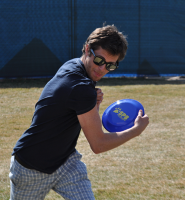 A Quinnipiac student spends time outside on the Quad Thursday afternoon playing with a free frisbee from Student Programming Board. Quinnipiac students spend time outside on the Quad Thursday afternoon performing backflips. A Quinnipiac student plays volleyball Thursday afternoon on Mount Carmel campus.